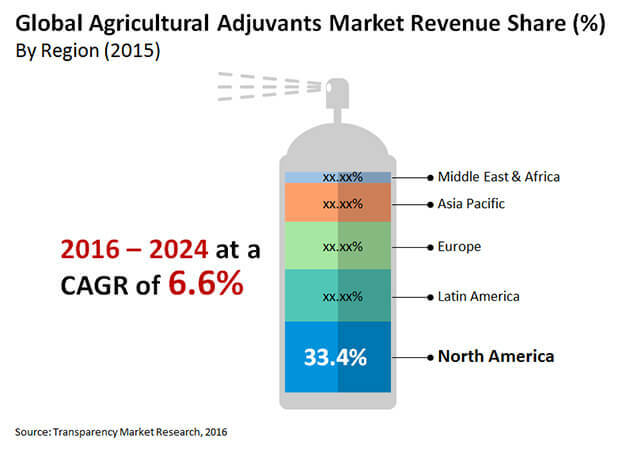 The global agricultural adjuvants market is highly consolidated in nature with a few players significantly ahead of the curve, leaving little opportunities for new entrants. According to a recent publication by Transparency Market Research (TMR), Clariant, Solvay, and Akzo Nobel N.V. collectively held 51.1% shares in 2015, primarily controlling the supplies of agricultural adjuvants in the developed economies. The same year, global agricultural adjuvants market had a demand volume of 757,570 kilo tons. The TMR report suggests that the presence of advanced mechanisms, which has enabled the three leading players to optimize their production rate, the competition among them will remain high during the forecast period. On the other hand, smaller players make use of stringent local regulatory policies from governments regarding the availability of raw materials to make their mark in the agricultural adjuvants market. The report estimates that the global agricultural adjuvants market had an opportunity worth US$2.36 bn in 2015, which will reach a valuation of US$4.16 bn by the end of 2024, expanding at a healthy CAGR of 6.6% during the forecast period of 2016 to 2024. Application-wise, the report segments the global agricultural adjuvants market into herbicides, fungicides, insecticides, and others. Out of these, herbicides segment is most profitable, owing to its use to increase efficiency of the agrochemicals, which thereby leads to improved quality and incremented produce. In 2015, herbicides accounted for 45% of the global demand for agricultural adjuvants. Changing farming practices with technological advancements and rapidly increasing demand of food are two primary driver of the demand for herbicides. The report observes that globally, aggressive steps are being taken to upscale the production of cereal and grains, oilseeds and plantation crops, and fruits and vegetables. By product type, the report bifurcates the market into activators including surfactants, oil adjuvants, and ammonium fertilizers, and utility. Currently Activator adjuvants segment serves maximum demand and continues to grow at most robust rate, gaining from the popularity of precision farming. Geographically, the report studies the opportunities available in the regions of North America, Europe, Asia Pacific, Latin America, and the Middle East and Africa. Several key players in this market are based out of North America, primarily in the U.S. and Canada, as the region has shown high rate of adoptability of advanced technologies of agriculture. However, strict regulations pertaining to the protection of environment and disposal of agrochemical waste is hindering the growth rate of the region. The formulation of agrochemicals with agricultural adjuvants helps in proper spreading as well as retaining spray droplets on the leaf surface. As the demand for food escalates across the world, farmers and agricultural agencies are actively adopting new technology and this factor is the primary driver in the global agricultural adjuvants market. In addition to that, the damage and loss of crop due to traditional pest control has further fueled the demand for agricultural adjuvants, although regulations for proper agrochemical waste disposal and environmental concerns is hindering the growth rate. According to the author of the report, "Asia Pacific is quickly turning into a lucrative region due to increased focus on expanding agricultural production in the India. Introduction of commercial farming and contract farming will further favor the global adjuvants market." The author also anticipates continuous research in agricultural adjuvants to lead to more effective use of agrochemicals, and in turn increased crop production. Although price volatility of agricultural adjuvants remains a concern for the market participants.